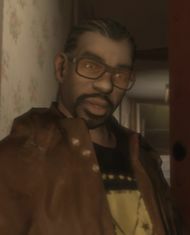 "Little" Jacob Hughes is a character in the HD Universe and a prominent character in Grand Theft Auto IV, he is friends with Roman Bellic and becomes a good friend to protagonist Niko Bellic shortly after the start of the game. He is 26-year old Jamaican arms and drug dealer who lives at 1006, Dillion St in Schottler, Broker. Jacob is second-in-command and a good friend of Real Badman, and is part of the Hillside Posse. He operates from his home, and out of a pool hall called the Homebrew Café. Jacob plays an important role in the game, and many missions, tasks Niko has to do are almost impossible without his assistance. He also becomes a friend and, if the relationship level is high enough, sells weapons to Niko at a convenience and discount. He helps Niko gain revenge on the final mission of the game, where he tracks down Niko's targets for him. Not much is known about Little Jacob's past, he was born in 1982 in Jamaica, it is assumed he moved to Liberty City before 2001 as that is when his first offense is cataloged in the LCPD database. In 2001, when Jacob was 19, he was caught for armed robbery. A year later, when Jacob was 20, he was caught again for breaking into an unspecified place with intent to burglarize. He was last pinched in 2006 for possession of marijuana. Little Jacob meets Niko Bellic through Roman Bellic, whom he apparently befriended after being a regular fare for Roman's taxi company. Little Jacob is attending a meeting with a rival member of a different Jamaican gang, however as Jacob feared, two more men unexpectedly join the meeting with intentions of killing Jacob. Niko dispatches of the three gangsters, including a fourth who attempts to get the upper hand on Niko from the roof. After this mission, Niko and Little Jacob exchange numbers, and their relationship is formed. Jacob and Niko work together temporarily for Real Badman, delivering drugs and eliminating rival dealers. Little Jacob eventually becomes close friends with Niko and aids him in many situations -- along with selling him discounted firearms, and offering Niko various drug delivery missions he warns Niko of a suspected ambush by Dimitri Rascalov, going with him as backup. Little Jacob is also associates with Elizabeta Torres, who he says is way too dangerous (even in Badman's opinion). On Elizabeta's last drug transaction, they get in an extremely heated argument which is intervened by Niko. Jacob waits for his contact while Niko heads out to disrupt the cocaine deal for Elizabeta. However, after Niko retrieves the coke and brings it back to Jacob, Niko's girlfriend Michelle appears, states she is working for the government and takes Elizabeta's coke from Niko. The United Liberty Paper take note of Little Jacob's trusting affiliation to Niko, and they hire him to aid Niko during the murder of a supposed Russian terrorist, manning the rockets during a helicopter chase. The bond between Jacob and the Bellics is so tight that both Little Jacob and Real Badman attend Roman Bellic's wedding; following an attack on the wedding, Little Jacob aids Niko in hunting down and murdering Jimmy Pegorino or Dimitri Rascalov (depending on how the story has unfolded) as revenge. It could be said that Jacob is Niko's truest friend in Liberty City, as he unconditionally and unhesitatingly came to Niko's aid both in this situation, and the earlier ambush by Dimitri. Little Jacob is still alive as evidenced by his Lifeinvader page showing as one of the listed friends of Niko Bellic on his Lifeinvader page. This can only be seen when switching to Michael De Santa in GTA V and looking at Jimmy De Santa's laptop if he appears in their dining room during the switch. Little Jacob reveals considerably less about his personal life than other friendship characters. Instead, he and Niko often insightfully discuss philosophy and concerns for other people they know. According to Badman during his random encounter, Jacob has a girlfriend that he loves very much and often treats to gifts (which Jacob mentions once himself). Jacob and Badman once had a third friend nicknamed Grandad who could keep Badman calm, but he has since then moved to Jamaica. One of Jacob's best traits is loyalty, as he always stands by Niko and goes out of his way to help him. Jacob is the archetypal Rastafarian who speaks in Iyaric (terms like "I and I"), discusses Jah, Rasta and Zionist ideals with Niko, and finds most non-Ital food and weed distasteful (ironically, his first appearance in the game is a brief cutscene outside a Burger Shot and he also likes the food in Cluckin Bell). His accent is difficult to understand, but much easier in comparison to Badman's near-impenetrable Jamaican patois, so Jacob often acts as translator. He loves reggae music, particularly the stations Tuff Gong Radio (an all-Bob Marley station) and Massive B Soundsystem 96.9. He mentions being a huge fan of reggae artist Sonny Bradshaw, calling him his "uncle" spiritually. Niko agrees that "he plays good music" but sadly he is not featured on the game's soundtrack. Jacob and Niko also both like Bobby Konders. Jacob constantly smokes marijuana (even during the helicopter chase), seeing it as "enlightenment", although other times he says he is trying to quit. He often speaks of his concern for Badman smoking too much marijuana and becoming highly paranoid (an effect that Jacob does not experience). Jacob confesses that he thinks Badman could try to kill him out of paranoia. When the player unlocks Little Jacob's special ability as a friend, Niko can call him and purchase several weapons at a discounted price from his car in a secluded location. The best times to call for activities are between 1pm - 4am. Jacob owns a red Virgo, and inside its trunk contains the weapons for the player to purchase. Believed to be part of a Marijuana and Cocaine distribution network run by Teafore Maxwell-Davies, street name - Real Badman. Suspect in several armed robberies and hijackings. In the early pre-release artworks, a character that can only be presumed to be Little Jacob (due to being Jamaican, smoking and being mentioned) has short hair. His hair was probably changed to fit more within the Jamaican stereotype. In the Mafiya Work multiplayer mode of GTA IV, Kenny Petrovic calls him "Small Jacob" instead of "Little Jacob". Jacob often refers to Niko as "Rasta". On Lifeinvader in Grand Theft Auto V, Franklin Clinton's cousin Tavell Clinton claims that he's moved to Schottler, and is living with two Jamaicans and a student from Senegal, stating that they're four black men who can't understand each other. Tavell may be living with Little Jacob and Real Badman at their apartment on Dillon Street. Early GTA IV game art of Little Jacob. A pre-release GTA IV screenshot of Little Jacob shows him with an aged appearance and no glasses. Jacob in GTA IV during "Shadow" with an alternate outfit that includes a zebra jacket and vest. Jacob's unique red and black Virgo in GTA IV. gta4onlineguide.com, containing details on how to raise Little Jacob's like percentage in GTA IV. This page was last modified on 10 May 2014, at 13:32.